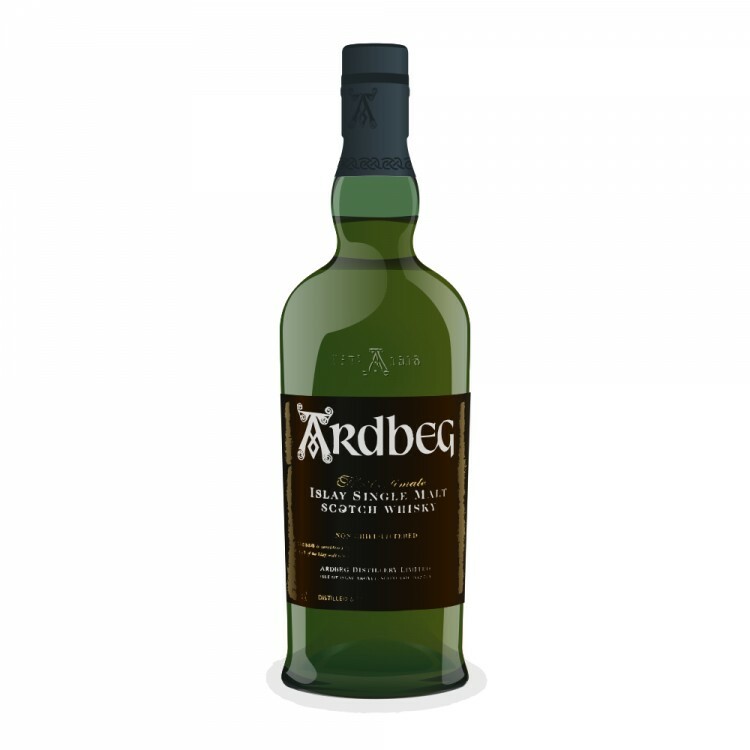 I'm comparing Ardbeg's fancy Galileo to Ardbeg's bottom of the line 10 year, which is wonderful in its own right. Color: surprising difference! the 10yo is almost white, a pale citron. looks like it was only ever in oak. Galileo, is a beautiful amber russet. akin to mead vs. rum. Nose: 10yo is iodine, seaweed, charcoal, cigarette tobacco; Galileo is much more complex: plum, raisin, melon, blood, dusty cardboard, Christmas mass incense. Taste: 10yo is smoke, chocolate, dark cherry; Galileo is coffee, chocolate, spicy orange, caramel, leather. Finish: 10yo is tangy, chocolate, smoke in the back middle of the tongue and back palette; Galileo is much sharper with wood, coffee, chocolate, leather, cigar tobacco, smoke that covers your whole mouth. the extra 3% ABV makes a difference. I love the warmth of the Galileo. By itself, the 10yo is fine. Next to the Galileo, it's pale crap. The Galileo is lovely. I want to compare it to the Alligator next. Ardbeg 1999 Galileo 12 Year Old Spaceage? Ardbeg 1999 Galileo 12 Year Old Islay from Outer Space! I once ordered three Ardbegs at once: Uigeadail, Corryvreckan, and Galileo. The Galileo was the most drinkable to my wife. I found the Galileo less balanced and sophisticated than the Uigeadail. The Corryvreckan was too amped up for my tastebuds. It was really hot and smoky. I didn't add water to any of them and should have in all fairness. After my taste test, I ended up buying a bottle of Uigeadail. It seemed like a happy medium to me. In Oregon, the Galileo is too expensive in my estimation. It's up around $100 whereas the Uigeadail is $22 less. The ten year Ardbeg is very reasonably priced here but I am not a big fan of the ten year. I do like my bottle of Uigeadail very much. I tend to add a few teaspoons of filtered tap water to my drams of it. This said, I've found that Ardbeg 10 goes extremely well in cocktails. A bar called Sweet Hereafter in Southeast Portland makes a cocktail called The Long and the Short of It with Ardbeg that is simply fantastic. One of the best mixed drinks I've ever tasted. I can throw back one after another and I'm embarrassed to say that I have on a few occasions. A friend of mine tried to keep up with me and got 86'd from the bar for drunkenness. I was not even slurring my speech at the time and stayed for one more before leaving since my wife was driving and she doesn't ever drink more than two drinks tops when we go out. My friend is 6'4 and outweighs me by about 40 pounds. He is not used to drinking Ardbeg. I find that Ardbeg Ten hits people hard that are not used to it. I love Uigeadail! I had Uigeadail and Alligator back to back at FX McRory's, and Alligator won. Not by a landslide, just clearly the winner. That's very interesting. Well, I'm going to try Alligator one of these days. It's at the Highland Stillhouse so I have the luxury of givin it a go. I do also like the Galileo. I still might purchase a bottle before it disappears off the shelves in a year or so. I guess it won't last forever. I agree it is tasty and the lack of balance grows on you. It's fun to have your tastebuds tugged two ways if you are in the mood for it. Nice post, Manning. I always enjoy reading comparisons. Have you tried any of the Octomores, Manning? Sounds like you would like the series. Comus is the most interesting to me in the series since it has some sweet and smoke in it, as with the Uigeadail but in a much higher strength of phenols. The complexity of peat influence is allegedly phenomenal in Octomores. If you ever decide to order a bottle up there in Washington, I might be up for ordering a bottle if you place a mail order and piggybacking on your order. We can't get it down here in Portland. I'm very curious indeed about the Octomore series. Highland Stillhouse does not have it, so I have not tried it. We can't do any mail orders down here due to OLCC regulations. You can, of course, in WA since it was deregulated . . . . I will definitely have to try the Octomores, and I like the idea of grouped ordering. Let me see about that. Please compare the 10 to the Uigeadail next. Great review!